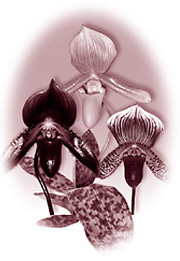 The Paphiopedilum or Lady's Slipper is by far one of the most unique and intriguing of all orchids. Its exotic, wax-like, richly colored blooms last for weeks and sometimes months. Lady's Slippers have no pseudobulbs but feature attractive, glossy leaves. After leaves are fully formed, the flower stem rises from the center of the new growth to form one of the most unusual flowers in the world. Best of all, they are ideal for home growing. Temperature: Paphiopedilum are divided into two temperature groups: warm and cool growers. The attractive mottled-leaf types come from the temperate zones and do best with a night temperature not below 60 degrees F. (preferably 65 degrees F.), and a day temperature of 75-85 degrees F. The solid green-leafed types come from the higher, cooler altitudes. They require a night temperature of 50-60 degrees F. and a day temperature of 70-80 degrees F.
Water: Paphiopedilum must be kept constantly moist or damp, but not soggy. Check frequently below the surface to determine the need for water. Normal watering intervals are between seven and ten days. Feeding: Good results may be obtained by using a high nitrogen fertilizer (25-9-9) all year round. Feed once a month at one-third of a teaspoon or less to a gallon of water. Paphiopedilum are sensitive to fertilizer burn. Repot: Paphiopedilum should be repotted every two to three years with a fresh, well draining potting medium, such as fine-grade orchid bark or Orchid Mix. It is important that the base of the growth be potted no deeper than 1/2" in the medium. 1. When you first receive your Paphiopedilum choose a spot for it and move it from that spot as little as possible. 3. After you receive the plant wait 10-12 days before watering it, after the first watering, water it once a week. When watering is complete, ensure that all the residual water has drained from the bottom of the pot before replacing it in its decorative container. Enjoy.